The e-Visa is an official document permitting entry into and travel within Tajikistan. You can apply for an e-Visa only if you are not currently in Tajikistan. Applicants will receive their visas via email, after filling the application form with the necessary information and once the online credit card payment is completed. 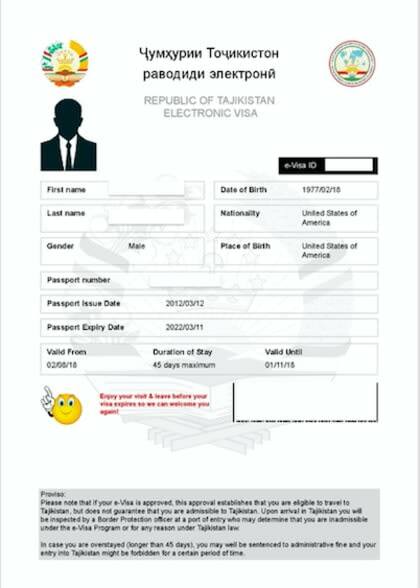 The electronic visa is valid for 90 days after issue. You can enter Tajikistan on any date within this period, however, the visa holder can stay in the country for no more than 45 calendar days. If you overstay your visa, you might be asked to pay fines, be deported or banned from future travel to Tajikistan for a specific period of time. It is an official document which provides authorization to travel to and from Tajikistan. It is electronically linked to your passport. The Tajikistan e-Visa costs 50 USD. Additionally, there is a service fee of 20 USD for standard processing. For rush processing and super rush processing the service fee is 50 USD and 70 USD, respectively. The Tajikistan e-Visa is valid for 90 days after issue. This means you must enter Tajikistan within 90 days. It is a single entry visa and allows for a maximum stay of 45 days. What conditions must the applicant’s passport meet for the Tajikistan e-Visa? No, an extension of stay is not allowed. You must leave Tajikistan and reapply for a new visa if you wish to stay longer than the 45 days allowed. No. The Tajikistan e-Visa must be obtained prior to your entry into Tajikistan. Yes. it is required that each applicant, even if they are a minor, apply for Tajikistan's electronic visa. No. You do not have to get the electronic visa to Tajikistan if you are not going to leave the international transit area. Not a lot of people choose Tajikistan as their destination. It is a pity considering that, just like any other country, Tajikistan has plenty of places that you would find charming. Usually, people go there because they want to go trekking in the Fann Mountains. The world-renowned Pamir Highway is also in Tajikistan, so you may want to check that out as well. The point is that going to Tajikistan is definitely worth your while. However, just like before going to any other foreign country, you need to learn some ground rules. It is nothing out of the ordinary, and surely you can comply with ease. First of all, you should know that Tajikistan is a religious country, and most of the population is Muslim. It is not as conservative as other Muslim countries, but you still need to respect their customs and traditions. People in Tajikistan are also Christians, and there are some other religions as well. The point of mentioning that Tajikistan is a religious country is that you need to make sure that you dress appropriately. For one thing, as a woman, you should never reveal too much skin. By too much skin I mean almost no skin. Women in Tajikistan do not wear hijabs and all that, but you need to cover as much of yourself as possible. You can wear long dresses without cleavage and with sleeves. However, if you are exploring, long pants and a loose blouse or sweater is your best choice. You can wear leggings with a long blouse as well. You should also have a scarf on you at all times just in case you decide to visit a mosque or any other religious site. You cannot enter without having your head covered. As for men, they will most likely dress like any other man in the world. You will see men in jeans and t-shirts, and sometimes you will see them with a suit. The religious aspect of Tajikistan does not affect them whatsoever. The best time to go to Tajikistan is from the middle of June to the middle of September, but that is if you want to have access to everything Tajikistan has to offer. As you can imagine, you cannot go trekking in the Fann Mountains in the winter because the access is restricted. In the summer is the best time because the temperatures are comfortable. Needless to say, if you are not interested in high altitudes, you can go anytime you want. A couple of weeks should be enough for whatever you plan to so, and visas grant you a 45-day stay. However, one mistake that tourists do when they go for the Pamir Highway is that they want to explore it all in just a couple of days. That is a mistake because that would imply too much time spent in the car. I suppose you do not want to sit in the car for 10 hours each day, do you? The best timeframe is somewhere between 8 and 10 days. That way you can explore multiple locations, and you have plenty of time to do it. So, take your time to not miss anything on the road. If you are a foodie, you will love Tajikistan. They do not have a famous cuisine, but the Tajik people know their way around the kitchen. Most meals revolve around meat, but they do not add a lot of spices. Even so, the dishes are delicious. The best way to experience Tajik food is to go and eat at tea houses, also known as chaikhanas or even in bazaars. What you will find quite frequently is chai itself. It sounds a bit Hindu, but given the position of Tajikistan on the map, that should not surprise you. You cannot leave Tajikistan without exploring some of its amazing valleys. You will find a lot of hidden lakes, and the scenery is fantastic. You need to pack some hiking gear even if you do not plan on exploring. Chances are that once you arrive in Tajikistan, you will want to climb some hills, at least. The view is mesmerizing, and you will fall in love with all the valleys you will come across to. That is a guarantee. If you want to stay in the urban area, which is not very likely, then you should visit the capital of Tajikistan, Dushanbe. In fact, if you travel by plane, that is where you will land, so you may want to stick around for a few days. You can go and see the World’s tallest flagpole or the largest tea house in the world. The bazaars are filled with all kinds of merchandise, and they are a great opportunity to buy some souvenirs for the loved ones at home. As you can imagine, the best food is in Tajikistan’s capital city so you may want to spoil your taste buds before putting on your hiking boots. There are many possibilities when it comes to getting around in Tajikistan. You have buses, shared taxis, which are very common, but the best way to go is to rent a car, especially if you are in Tajikistan for the Pamir Highway. You do not want to miss the opportunity to absorb the scenery just because someone is rushing you nor because the meter is running, do you? It may be an extra expense, but it is worth it. Tajikistan may not be your first choice when it comes to places where you would spend your vacation, but it is a location worth considering. You should not ignore a charming destination just because you do not know anything about it. Now you do, and hopefully, you will find yourself in Tajikistan in the near future. The tourism is growing there, and people seem very excited about it. They may not speak English, but thanks to technology, that is no longer an issue.